So far this year, both the S&P 500 Index and the price of gold are in slightly negative territory. That’s wouldn’t be worth observing if not for the fact that both the price of oil and interest rates have recorded double-digit increases at the same time. In theory, the inflationary pressures created by rising energy prices and steeper borrowing costs would either push up the price of gold and/or send the stock the market into a deep correction. The fact that neither of those things has happened, at least so far, shows how far the global economy has come over the past nine years. In 2009, PIMCO economist Mohamed El-Erian famously coined the phrase “the new normal” to describe the post-Great Recession global economy. He posited that the financial conditions causing the stock market to crash would suppress a recovery for many years to come. Fortunately, El-Erian’s expectation for stagflation because “central banks and treasuries will find it difficult to undo smoothly some of the recent emergency steps” did not prove true. Instead, the actions taken by the Fed and Treasury Department induced a long and gradual recovery that helped pull the global economy out of recession. However, the global economy is now dealing with a new set of financial conditions that in the past would have sent the stock market reeling. The price of oil recently rose above $70 a barrel, nearly 50% above its value one year ago. Although good for companies that produce a lot of oil, higher energy prices are a net drag on the overall economy. 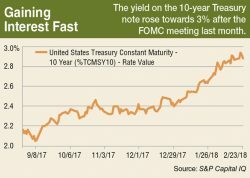 Also rising is the yield on the 10-year Treasury note, recently breaking above 3% after beginning the year below 2.5%. Just as rising oil prices result in higher transportation and utility costs for most businesses, rising interest rates push up the cost of borrowing money to finance their operations. The stock market has defiantly held its ground against these mounting headwinds, ceding less than 3% of its value through the first four months of 2018. So far, corporate profitability has not suffered from the higher costs associated with rising inflation. If that remains the case, then we may be entering into an unprecedented phase of economic growth where inflated stock prices and rising inflation can co-exist without the need for a recession to reset equity values. This unusual set of conditions further begs the question of how much longer stocks can trade at inflated multiples. If Amazon.com (NasdaqGS: AMZN) was worth 80 times forward earnings back when the 10-year Treasury note was yielding 1.5%, why is it still valued at the same multiple when the T-note yield has doubled? As interest rates rise, the future earnings expectations driving Amazon’s rich valuation should be discounted at a steeper rate, thereby driving down the present value of its share price. Meanwhile, Apple (NasdaqGS: AAPL) has consistently traded at roughly 14 – 16 times forward earnings despite being significantly more profitable than Amazon in the present, so those earnings need not be discounted at all. I don’t buy the argument that both companies are fairly valued based on their respective long-term profitability. There simply is no way to know what either company’s profitability will look like ten to twenty years from now, so suggesting one has more than five times the earnings potential of the other is at best an optimistic extrapolation. Instead, it appears that mega-cap stocks like Amazon and Apple have become their own form of currency. Just as one currency can be swapped for another at an exchange rate to equalize the difference in their perceived values, so too can one stock be traded for another if you are willing to accept the difference in their earnings multiples. For example, one share of Amazon can be “exchanged” for approximately six shares of Apple, just as one U.S. dollar can be exchanged for six Chinese yuan. From that perspective, the stock market’s seeming indifference to rising inflation makes sense. So long as investors value Amazon at 80 times forward earnings, the only variable that matters is what those future earnings are believed to be. Currencies are measured by purchasing power, not profitability. Therefore, the more cash flow a company generates, the more purchasing power it possesses. That would explain why growth in revenue has superseded earnings growth as the primary yardstick for valuing stocks. In that case, Amazon’s anemic profit margin of less than 2% is of little concern so long as it can continue to grow sales at nearly 40% annually. Likewise, Apple’s 21% profit margin is trumped by its comparatively tame 12% increase in revenue. How this all will end is anyone’s guess. 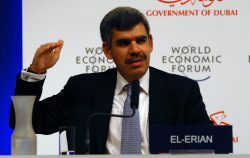 I admire El-Erian for putting his “new normal” hypothesis in plain view for all the world to critique nine years ago. He may not have gotten the timing right, but sooner or later the stagflation El-Erian expected may manifest itself in the form of companies whose revenue growth vastly exceeds their profitability.